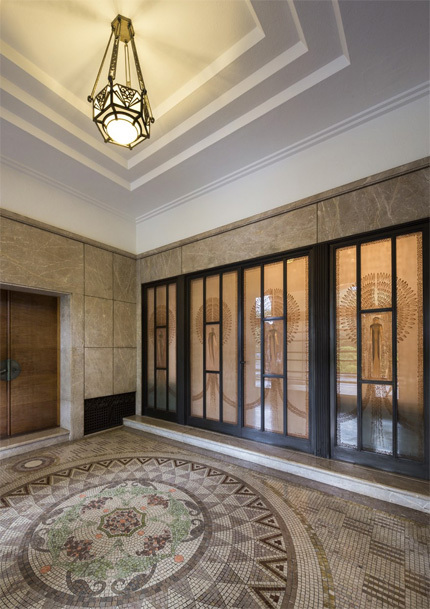 The glass-relief doors in the front entrance hall are the work of the French glass artist René Lalique. A new design created especially for the Prince Asaka Residence and executed in pressed glass, each door features a standing female figure surrounded by a backdrop of open wings. These doors are significant in Lalique’s oeuvre not only because of their large size but also because this was a one-of-a-kind, exclusive commission. The floor is finished in a finely worked mosaic of natural stores according to a design by Takashi Oga of the Imperial Household Ministry’s Construction Bureau. 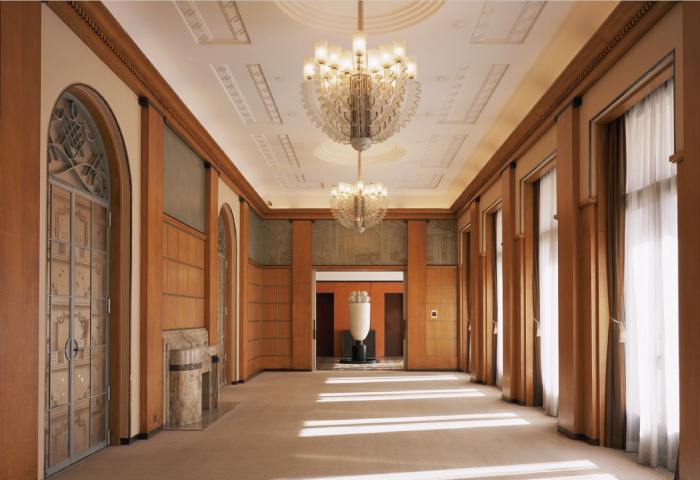 The door to the left, when facing the Lalique glass relief doors, leads to the official waiting room, while the door to the right opens into the reception and cloak areas. This room, accessible directly from the front entrance hall, was used to receive visitors who came to the prince’s household on official business. Servants and staff who accompanied visitors would also wait here while their employers were elsewhere in the residence. The interior woodwork, including the columns, doors and window sills, is done entirely in maple. 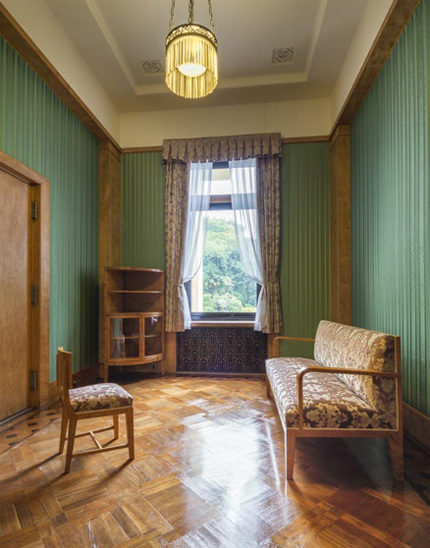 The parquet floor is a checkered pattern of zelkova with a border in ebony and Chinese quince. 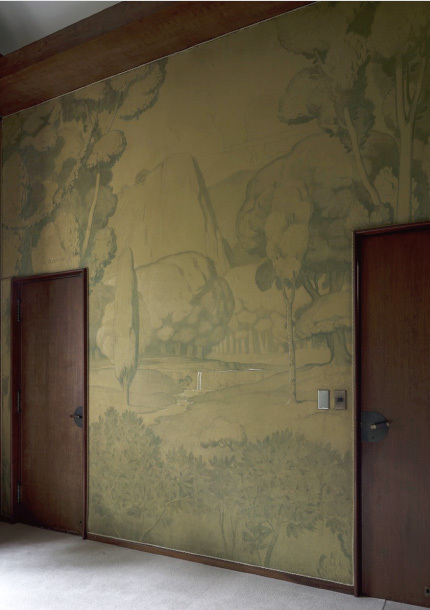 The wallpaper is a reproduction of the original wallpaper installed when the residence was built, one of the “Tekko” series wallpapers made by the Swiss manufacturer Salubra. The walls of the great hall are finished in walnut paneling, creating a refined space with spare decoration. Overhead lighting is provided by an arrangement of 40 circular lamps framed neatly in wood. The marble mantelpiece and large mirror above it, which is at the front of the room centered between two arches, add a touch of splendor to the overall subdued and symmetrical design. 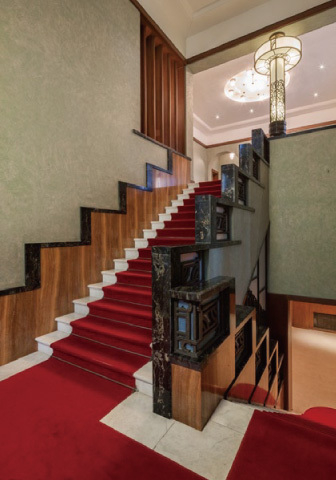 The marble relief to the right of the main staircase, “Children Playing,” is the work of Ivan-Léon Blanchot; its classical styling lends a sense of serenity to the space. All four walls in this room are finished with oil-on-canvas paintings by Henri Rapin. These landscapes, which depict trees and water in soft green hues, make the viewer feel as if they have been transported into a verdant wood. The artist’s signature, “H. Rapin,” can be seen over the door that leads to the terrace. The mantlepiece is made from tinos green serpentine stone imported from Greece. The anteroom, which faces on to the southern terrace, serves to connect the small drawing room and the salon. This room is designed with vivid color – the white of the porcelain fountain, the multi-colored mosaic floor, the rich black of the lacquer columns, the vermillion of the man-made stone walls and the green of the garden seen through the windows. Here, these colors come together in a harmony that is in direct contrast with the subdued ambiance of the great hall, creating a lively space with uniquely Art Deco characteristics. The white shikkui plaster ceiling with its inset circulardome softens the room and saves it from feeling overdecorated. 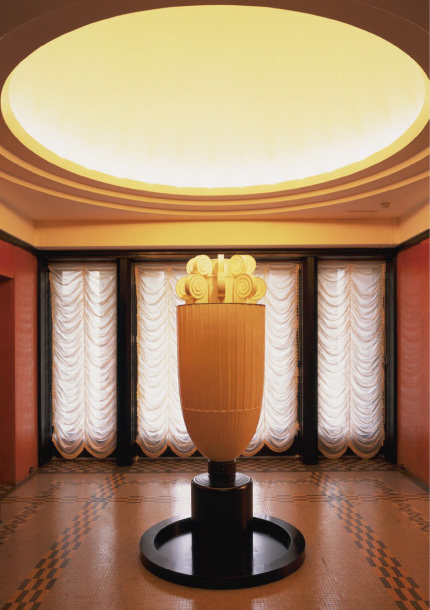 Although a small space, the anteroom fully expresses Art Deco design in the way materials and color are used. The fountain, which came to be called the “Perfume Tower” because it emitted scent along with flowing water, was designed in 1932 by Henri Rapin and manufactured at the Sèvres National Porcelain Manufactory in France. 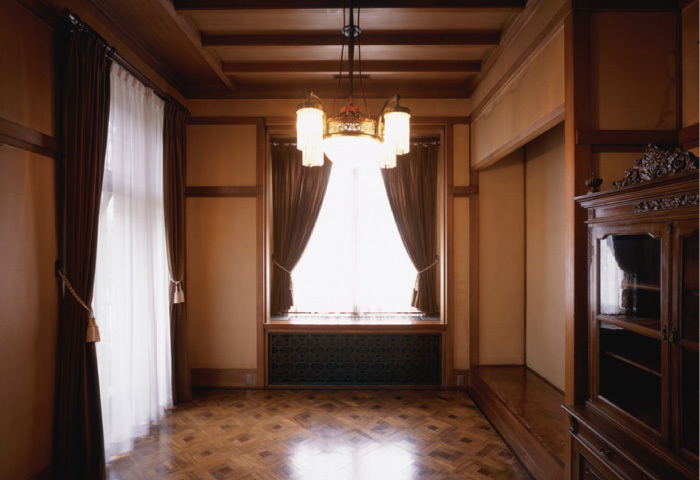 When the residence was used by the Prince Asaka family, perfume could be placed in the upper lighted portion. The heat of the lamps would warm the perfume, filling the room with pleasant scent. In the records of the Sèvres National Porcelain Manufactory, this work is referred to as the “Vase Lumineux Rapin” (“Rapin’s Brilliant Vase”). 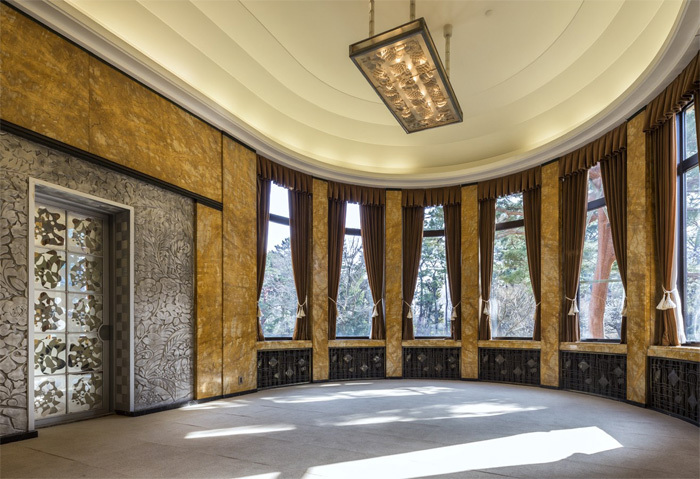 Of all the rooms in the Prince Asaka Residence, the salon, together with the great dining hall that adjoins it and the terrace facing south onto the garden, embodies the true chic of Art Deco design. The columns with their Ionic-style crowns are made of sycamore wood. On the ceiling, the chandeliers are set off by the plaster molding in a zigzag pattern. The paintings on the wooden panels on the upper part of the walls are by Henri Rapin. Geometric floral motifs can be seen throughout this room, in the chandelier designed by Réne Lalique, the ornamental ironwork tympani by Raymond Subes over the doors, and in the silver-frost etched glass by Max Ingrand set in the doors. The great dining hall can be divided from the adjoining salon by closing the sliding etched-glass doors between the two rooms. In the great dining hall, the large circular bay of windows overlooking the garden gives the space an open feel. In keeping with its role as a place where guests would take meals, food motifs are used on the doors and the light fixtures. The glass-relief ceiling light by Réne Lalique employs a fruit motif while a motif of pineapples and pomegranates while the radiator covers are decorated with a design of fish and seashells. The oil painting above the fireplace is by Henri Rapin, depicting a garden with a fountain and a red pergola. The botanical themed wall relief was designed by Ivan-Léon Blanchot. During the residence’s construction, a concrete relief with this design was sent from France, but it cracked during transit. Artisans in Japan made a plaster cast of it and finished it with a silvery grey paint. The Prince and his family took their daily meals in this room. 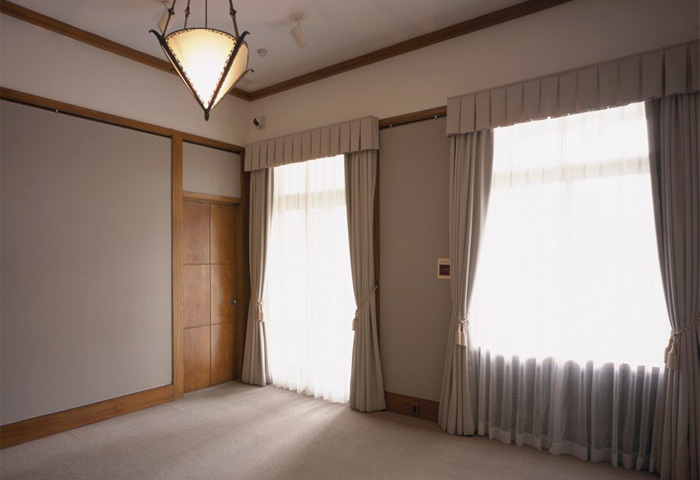 Although the residence as a whole is a Westernstyle building, an exception was made in this room which incorporates Japanese architectural and design elements. For example, the ceiling is made of panels of Japanese cypress and there is a tokonoma, the recessed alcove that is a feature of traditional Japanese architecture. The bronze radiator cover is decorated in a traditional pattern called genjik¯o. The parquet floor is made of rosewood and zelkova, surrounded by a border of ebony. Floor: parquetry in zelkova, ebony and rosewood. This staircase in the center of the house leads from the public spaces used for entertaining to the family’s living area on the second floor. In effect, the space provides a transition from the French-style Art Deco styling of the first floor to the Japanese-style Art Deco space above. 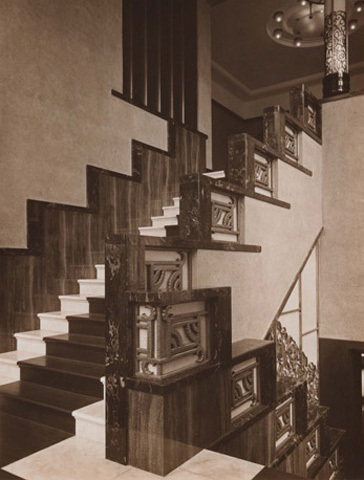 Marble is used for the steps, the handrail and the wainscoting panels that cover the lower half of the walls. The stone is bianco carrara and two other types of imported marble. The decorative elements of the handrail incorporate the zigzag pattern that is characteristic of Art Deco design, worked in pleasing balance with the lines of the handrail itself. The metalwork along the staircase is done in bronze. 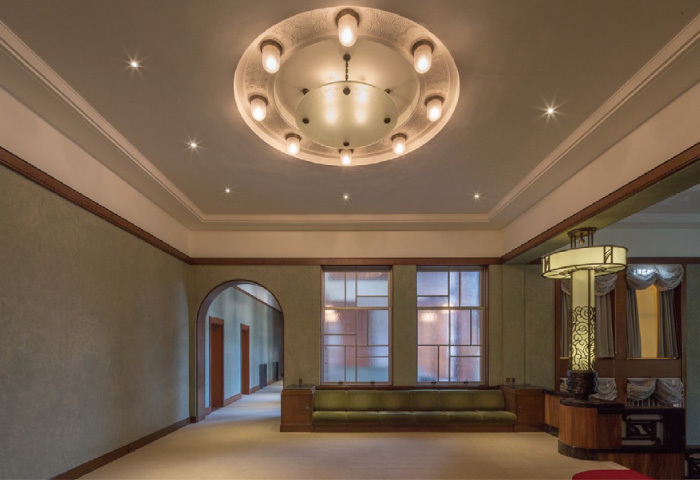 The lightening fixtures, including the illuminated pillar at the top of the staircase, incorporate floral designs that became a characteristic pattern of the Art Deco style. One can see the careful attention to design in details such as the water basin built in around the base of the illuminated pillar so it could be decorated with fresh flowers. 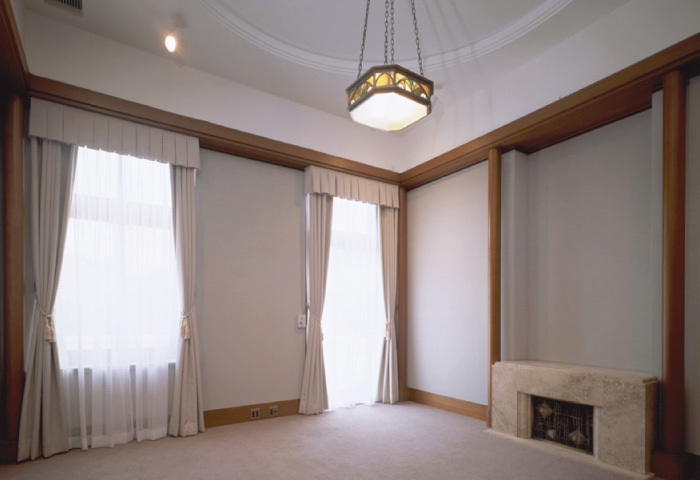 The living spaces for the prince’s family, including the second-floor hall at the top of the main staircase, were designed primarily by the head architects of the Imperial Household Ministry’s Construction Bureau. Various Japanese elements were incorporated in the design of these rooms, including the use of the traditional Japanese seigaiha (blue ocean wave) pattern on the radiator registers. In addition, patterns were worked with a trowel into the plastering on the walls, and the quality of this work is testament to the high level of skill of Japanese plasterers at the time. A long sofa built in under the windows provides comfortable seating, and when the prince’s family lived in the residence, there was a piano here. This was space in which the family could come together to relax. A suite of rooms for the young prince occupies approximately 2/3 of the space on the eastern side of the second floor. The three rooms in the suite are the young prince’s bedroom, dressing room and sitting room. 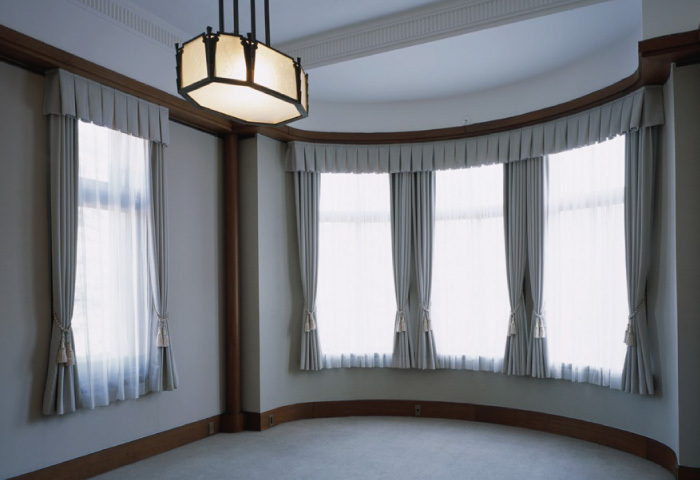 The lighting fixtures in all three rooms were domestically made and designed by Masao Mizutani of the Imperial Household Ministry’s Construction Bureau. The high level of craftsmanship exhibited here is one of highlights of the former Prince Asaka Residence. The bay windows in the young prince’s bedroom are from the time of construction and still have the original sashes. The contrast between the simplicity of the white shikkui plaster vaulted ceiling and the marble pattern on the walls makes this a very distinctive space. This young prince’s sitting room is situated directly over the front entrance hall, and its veranda is built over the roof of the port-cochère at the front of the residence. The room is almost a perfect square with the round columns providing accent. When the residence was built, the wall paper in this room was dark blue. 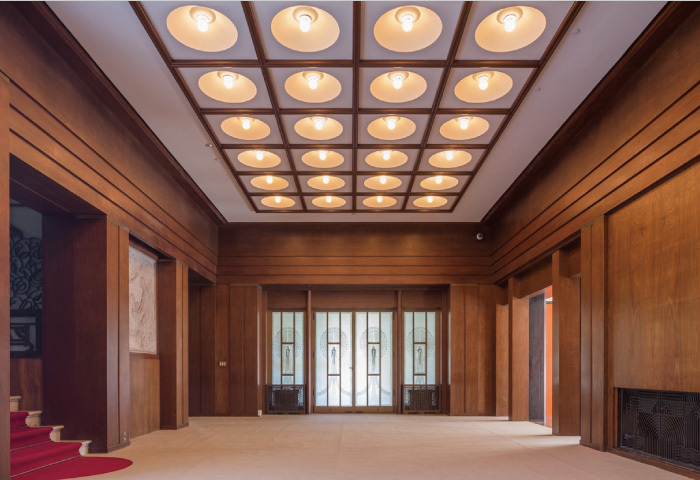 The white shikkui plaster ceiling is finished with a beautiful circular inset from which hangs a stained-glass lighting fixture that casts the room with a warm atmosphere. 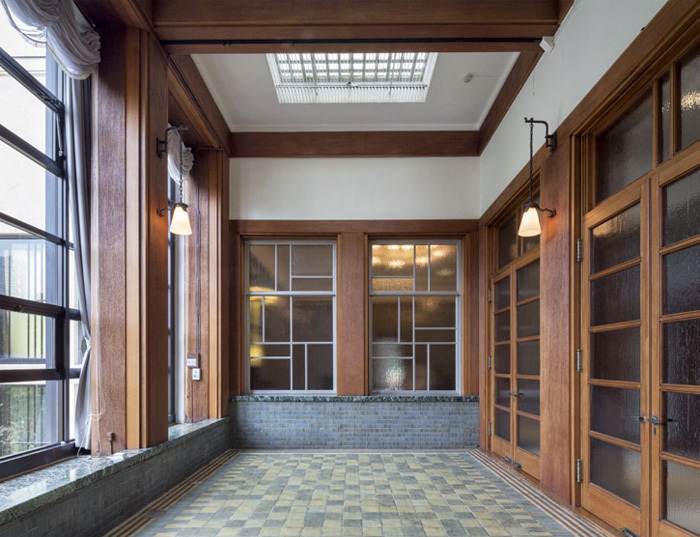 The flooring on the veranda is done in with clinker tiles, a building material that came into wide use following the Great Kanto Earthquake of 1923. The study is a square room which, by virtue of the shelving built into four corners, is rendered nearly round in shape. There are eight columns made of lemonwood spaced around the room, and the domed ceiling with its indirect recessed lighting brings the eye to the center of the room. 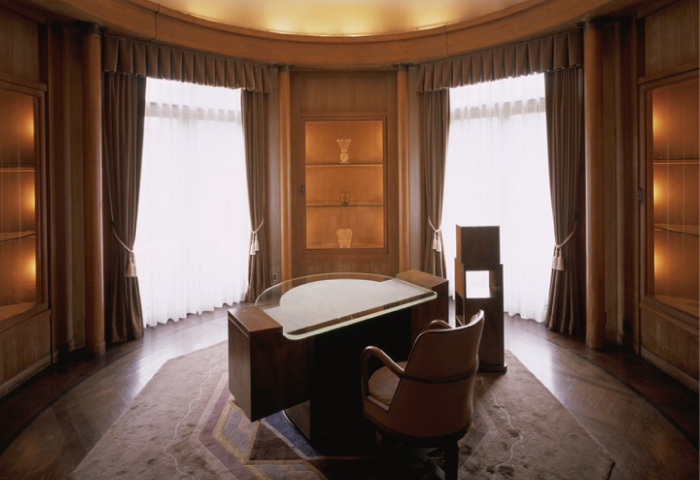 All the furnishings, including the carpet, desk and chairs were designed by Henri Rapin. Next to the study is a small library. The high vaulted ceiling in this room creates a sense of spaciousness, while the cypress columns and marble fireplace with a mirror above lend the space an atmosphere of refinement. 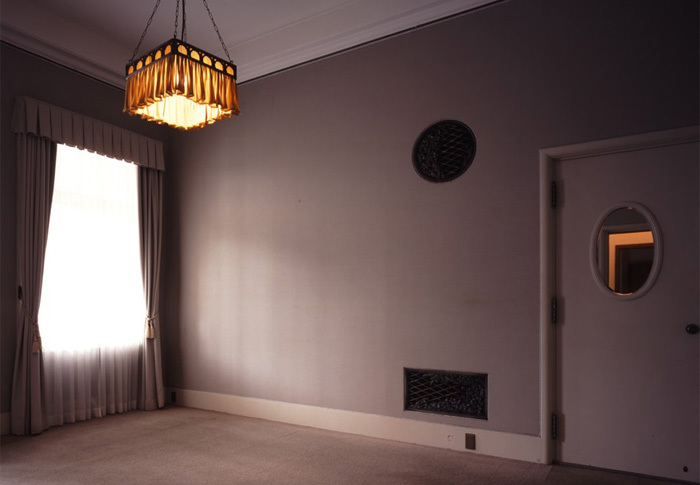 The radiator covers, decorated with the fountain motif frequently seen in Art Deco design, were designed in Japan and manufactured using a process called electroforming. The wall covering and curtains are 2014 reproductions that closely replicate the originals. Wallpaper: originally woven jacquard; the 2014 restoration is polyester. Touches such as the oval mirror in the white door and the cloth-shaded ceiling lamp that can be adjusted up or down give this room a feminine feel. The princess herself created the design for the heating registers. The décor in this room is more subdued than in the prince’s sitting room or study, providing a calm atmosphere well suited to sleeping quarters. The doors and columns are made of camphor wood. The four wooden doors feature natural irregularities in the grain of the wood that enhance the décor of the room. The pattern in the wood comes from a knot in the tree; the section with the knot was cut horizontally into panels to reveal a relatively large concentric pattern. While many of the rooms have distinctive lighting fixtures, the fixture in this room, with its five glass balls and set in the gently vaulted ceiling, is particularly striking. 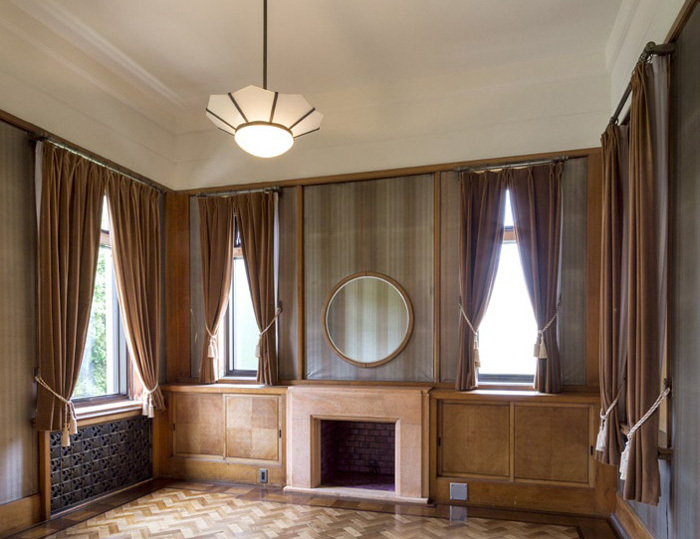 The princess’s own tastes can be seen throughout this room, in the large mirror made from a single pane of glass, the practical built-in cabinets and double doors. On the south side of the room is a semi-circular balcony from which the garden can be enjoyed. The flooring of the balcony is done in tiles from the Taizan kiln, which was famous during the early Sh¯owa period for its artistic tiles. Much of the young princess’s bedroom is finished in cherrywood. 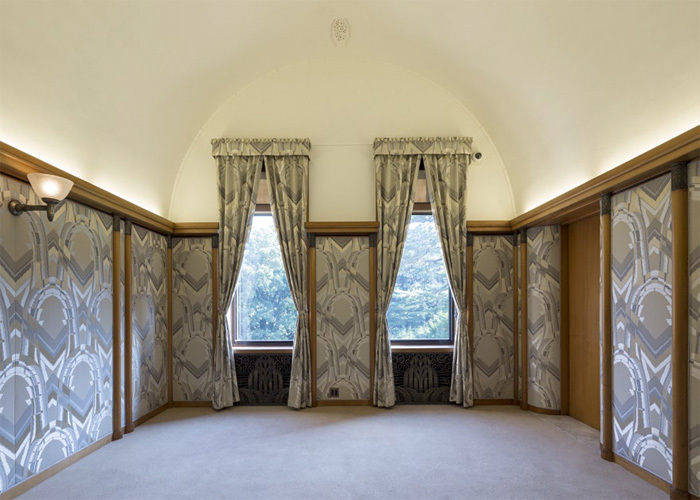 The “Tekko” wallpaper, which is the original wallpaper from the time of construction, was selected with input from Princess Nobuko to suit her daughter’s taste. 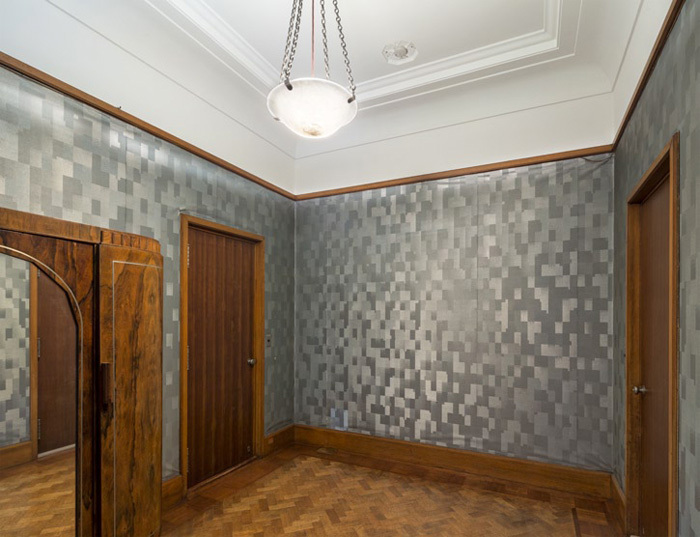 The blue-hued wallpaper is decorated with straight lines and geometric shapes, and has a metallic sheen that changes with the light. Floor: parquetry in a herringbone pattern in zelkova. 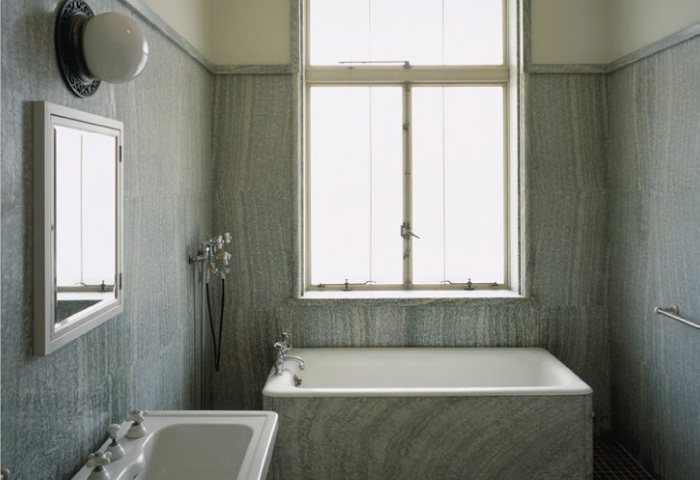 Located between the prince’s bedroom and the princess’s bedroom, this bathroom was used mostly by the prince. 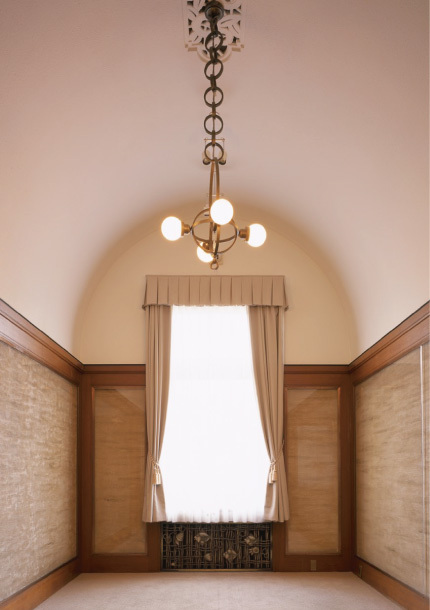 The floor is laid in a mosaic pattern with tiles made by the Tsubakigama Ceramic Manufacturing Co. and the walls are done in a French marble called “vert d’Estours.” There are two other bathrooms in the residence; one used mostly by the young prince and another shared by the princess and young princess. The veranda on the second floor of the south side of the residence provides a view onto the lawn and Japanese-style garden. It was exclusively for the use of the prince and princess, and could be accessed only through their bedrooms and sitting rooms. The floor is laid in a black-and-white checkered pattern of domestic marble. Known as the North Room because of its position on the north side of the residence, on the opposite side of the building from the south-facing veranda, this room was used as a place for the family to gather in the heat of summer. Skylights in the ceiling bring in natural light, giving the feeling that one is outdoors. Great care went into the details of this room, from the striking vertical pattern carved into the teakwood trim to the mosaic pattern laid in the floor done in nunome (linen-patterned) porcelain tile. An interior wall with large windows separates this room from the second-floor hall; the framing for these windows is done in an attractive pattern of vertical and horizontal lines, lending a modern feel to the room. The Winter Garden was built on the roof level as a conservatory in which to raise plants and flowers during the winter. There is shelving for plants, as well as a water faucet and drains. 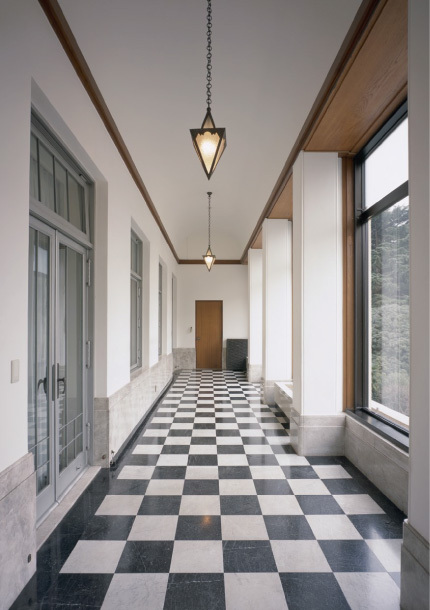 The black and white checkered floor is laid with artificial marble, while the panel on the wall is done in domestic marble. The fact that this difference in materials cannot easily be detected is testimony to the skill of the artisans who contributed to the construction of the residence. 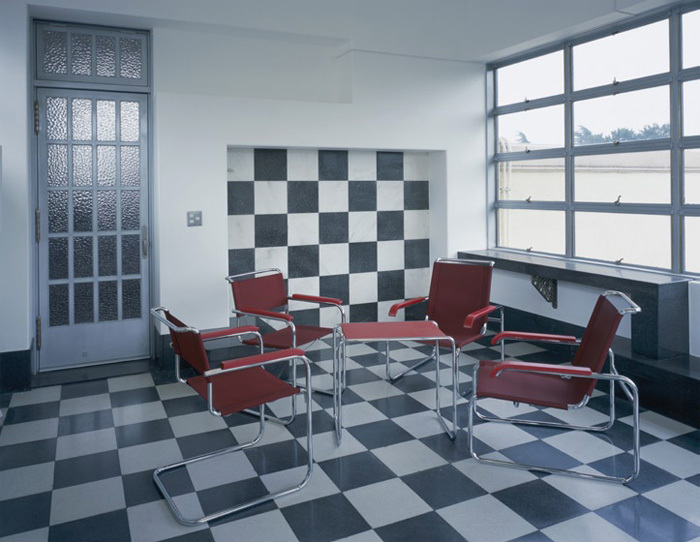 The room is furnished with chairs designed by Marcel Breuer. 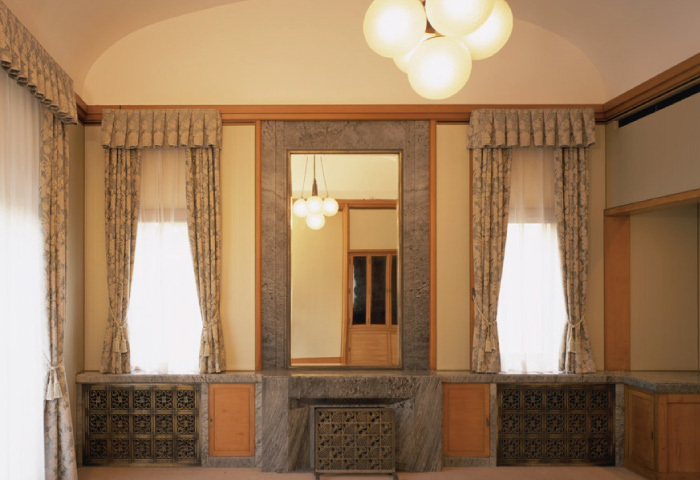 Prince Asaka personally purchased the chairs at a special exhibition on new German architecture and design, held in May 1923 at the Matsuzakaya Department Store in Tokyo.